Office hoteling software and asset reservation software solutions have quickly become strategic tools for businesses looking to lower costs and maximize growth. Thousands of organizations have reduced overhead, decreased energy consumption, created dynamic, flexible work environments and managed assets with cloud-based solutions. Streamline costs and empower a mobile workforce now. 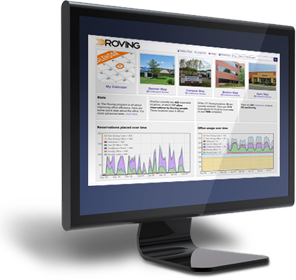 Roving is a comprehensive, adaptable workspace management and asset management solution. Make it simple for your employees to manage room reservations, resource calendars and shared assets. Simultaneously provide valuable, detailed usage statistics to business leaders, and enable informed decisions about office expansion. Have more specific or technical questions? Visit our Support page for answers. Interested in more information or a no-obligation quote? Send us a request. Copyright 2014-2015 RoviSys. All rights reserved.